Early on the first day of the week, while it was still dark, Mary Magdalene came to the tomb and saw that the stone had been removed from the tomb. So she ran and went to Simon Peter and the other disciple, the one whom Jesus loved, and said to them, “They have taken the Lord out of the tomb, and we do not know where they have laid him.” Then Peter and the other disciple set out and went toward the tomb. The two were running together, but the other disciple outran Peter and reached the tomb first. He bent down to look in and saw the linen wrappings lying there, but he did not go in. Then Simon Peter came, following him, and went into the tomb. He saw the linen wrappings lying there, and the cloth that had been on Jesus’ head, not lying with the linen wrappings but rolled up in a place by itself. Then the other disciple, who reached the tomb first, also went in, and he saw and believed. Then the disciples returned to their homes. There’s a lot about this story that doesn’t make sense. How could Mary see Jesus, but not know that it was him? How could she have a conversation with him, and not know that it was him? Some people suggest she’s so sad about Jesus’ death, she can hardly see or hear or understand anything through her grief. I think it’s amazing, in light of all of that, that when Mary hears her own name, everything becomes suddenly and perfectly clear. She didn’t need an explanation of how resurrection works. She didn’t need to reevaluate her theology to include this new development. She just needed to hear her own name. The sound of her name reminded her that she was known by Jesus, a part of his community. She was not alone, even in her deep sadness and confusion. I can’t help but wonder if maybe it was the promise and the comfort in those reminders that helped her to believe that new life was possible – for Jesus, and maybe for her, too. – Why do you think Peter and the other disciple left after they’d seen the empty tomb? Why do you think Mary stayed? If you had been there, would you have gone with Peter or stayed with Mary? Why? – Why do you think Mary did not recognize Jesus when she first saw him? – How do you think Mary felt when she heard Jesus say her name? – Have you ever mistakenly identified someone? (Or did anyone ever think you were somebody else?) Why did that happen? How did the confusion get cleared up? 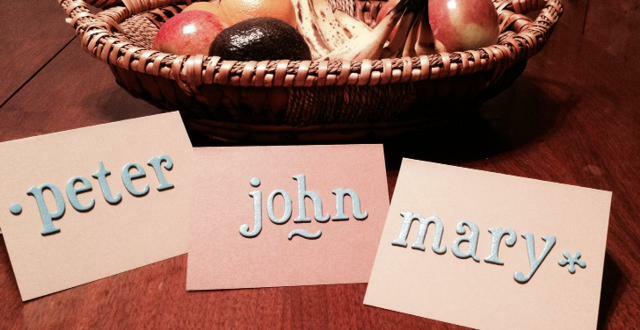 -decorate place cards for the people in your family, and put them out at meals. -sing that silly song (Mary-Mary-Bo-Barry-Banana-Fanna-Fo-Farry-Me-My-Mo-Mary… Mar-ry!) as a family, singing everyone’s name once. -sit down as a family and share the stories of what your names each mean (look up meanings if you don’t know), and have parents tell the stories of why they chose the names they did for their kids. -consider all the names for God and Jesus in the scriptures – a (very) partial list might include: I Am, Shepherd, Peace, The One Who Provides, God-With-Us, The Everlasting One, The Bread of Life, The Light of the World. Talk about which of these names is meaningful to you, and why. and that the tomb is empty. even death cannot hold it. that embraces each of us, and calls us by name. teach us to love one another. Tags: children, Easter, family, prayer, worship. Bookmark the permalink.